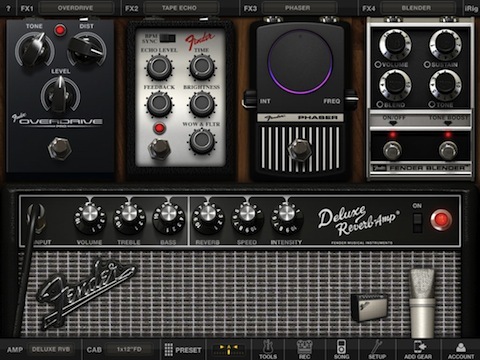 AmpliTube Fender is the latest iPhone and iPad app from IK Multimedia that converts your device into a series of Amplifiers and Effects for your electric guitar or bass. This iOS app is an extension of the AmpliTube Fender recording studio on the desktop. Real Fender enthusiasts will appreciate the authenticity of the sound the app produces not to mention its brilliant lifelike graphics. You’ll need the iRig cable sold separately. iRig has 3 connections which connect it to your a) iOS device, b) headphones or speakers, and c) your Guitar or Bass. The Fender release of AmpliTube comes with 6 stomp effects, 5 amps with 5 cabinets per amp, and 2 mics, all reproducing the classic clean sound of the Fender family of products. The layout and functionality are identical to the original AmpliTube for iPad and AmpliTube for iPhone apps. The Fender version is basically giving you a new set of rigs to use. You can use 3 effect on the iPhone or 4 on the iPad simultaneously. 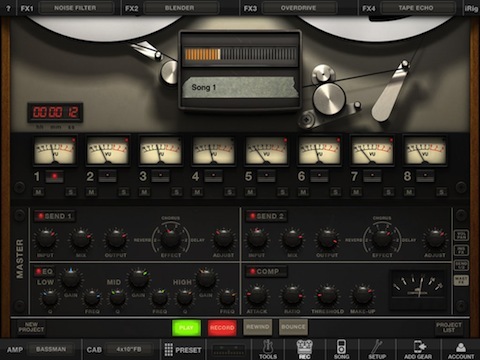 Record your sessions using the tape recorder interface on a single track for free. If you make the $14.99 in-app purchase you can have a full 8 track recording studio with master FX. Fully take advantage of the app and mix your own tracks on a super polished user interface. Tracks can be exported by E-Mail, File sharing or saved into the app itself. Emailed files are compressed into .m4a audio files. A comparable 4 track recorder on the iPhone is available for $9.99 as well. The app has a built in tuner and metronome. There are 10 audio demos you can listen to for inspiration and/or sample sounds. Use one of the 12 presets to quickly swap configurations. There are 24 additional spots for your own presets as well. Practice makes perfect! The Speedtrainer tool lets you import your own songs and slow down the song by 50% as you learn. What’s great is that editing the tempo doesn’t affect the song’s pitch. Th new AmpliTube Fender costs $14.99 for either the iPhone or iPad version. If you already own the original AmpliTube iPad app, get the Fender bundle inside your existing app via an in-app purchase of $4.99 per amp, $2.99 per stomp box. Also, if you have already bought the mixer in the old AmpliTube app, don’t buy this app. Instead go into your AmpliTube app and buy the Fender upgrades there. That way you don’t end up paying twice for the mixer and you have all your stuff in a single app. You may also start with a free version (only available on the iPhone) and expand its gear via in-app purchases. The free version includes 2 Stompboxes, 1 Amp and 2 Mics. Overall, if you’re a fan of the clean sound of Fender amps and fx kits, the new AmpliTube Fender app is a must have. I did not experience any crashes or glitches during my tests. The sound quality is flawless and has very little latency. The only advantage of the iPhone version is its mobility. If you have an iPad, go with the iPad version of AmpliTube Fender, no questions asked. The 8 track studio is brilliant and powerful. The large screen makes using the app much easier compared to the crammed feel on the iPhone, where you’ll have to continuously slide screens around. The iPad version lets you view 4 effects, plus the speaker and mic simultaneously. 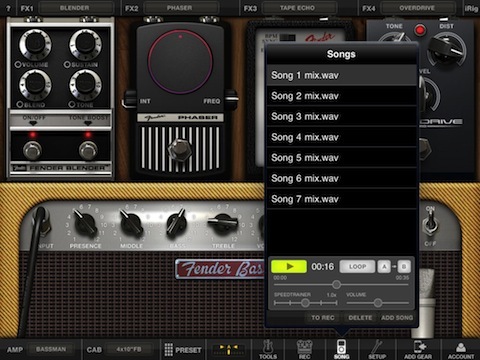 Sample the free version of AmpliTube Fender on your iPhone. AppSafari review of AmpliTube Fender for iPad was written by Joe Seifi on February 16th, 2011 and categorized under Accessories, App Store, Featured, iPad apps, Music, Utilities. Page viewed 6832 times, 1 so far today. Need help on using these apps? Please read the Help Page. for those who like amplifier is good.